The Color Your Day With Beauty™ Bouquet by FTD® is a stunning display of bold color to give your special recipient a gift that reflects their own unique charm and grace. 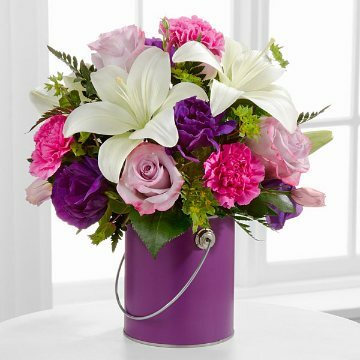 Lavender roses, fuchsia carnations, purple double lisianthus, white Asiatic lilies, bupleurum and lush greens are artfully arranged within a striking purple quart size decorative paint can inspired vase to create an incredible gift they won't soon forget. Standard bouquet is approximately 10"H x 9"W.
Deluxe bouquet is approximately 12"H x 10"W.
Premium bouquet is approximately 13"H x 11"W.